238 pages | 8 B/W Illus. Television is no longer the only screen delivering footage and news to people about sport. Computers, the Internet, Web, mobile and other digital media are increasingly important technologies in the production and consumption of sports media. Sport Beyond Television analyzes the changes that have given rise to this situation, combining theoretical insights with original evidence collected through extensive research and interviews with people working in the media and sport industries. It locates sports media as a pivotal component in online content economies and cultures, and counteracts the scant scholarly attention to sports media when compared to music, film and publishing in convergent media cultures. An expanding array of popular sports media – industry, user, club, athlete and fan produced – is now available and accessible in networked digital communications environments. This change is confounding the thinking of major sports organizations that have lived off the generous revenue flowing from exclusive broadcast contracts with free-to-air and subscription television networks for the last five decades. These developments are creating commercial and policy confusion, particularly as sports audiences and the advertising market fragment in line with the proliferation of niche channels and sources of digital sports media. Chapters in this title examine the shift from broadcast to online sports media markets, the impact of social networking platforms like Twitter and Facebook, evolving user and fan practices, the changing character of sports journalism, and the rise of sports computer gaming. 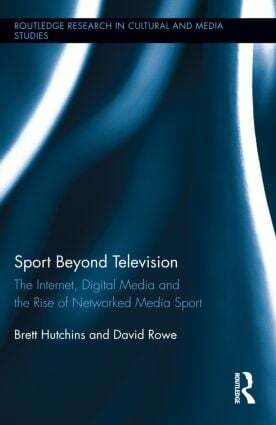 Each chapter traces the socio-cultural implications of trends and trajectories in media sport. Brett Hutchins is Co-Director of the Research Unit in Media Studies at Monash University. His recent publications appear in Media, Culture & Society, Information, Communication & Society, Journalism: Theory, Practice & Criticism, Convergence, and International Journal of Communication. He is the author of Don Bradman: Challenging the Myth (Cambridge University Press). David Rowe is Professor of Cultural Research in the Institute for Culture and Society, University of Western Sydney. His books include Globalization and Sport: Playing the World (co-authored, Sage), Sport, Culture and the Media: The Unruly Trinity (Open University Press) and Global Media Sport: Flows, Forms and Futures (Bloomsbury Academic).